Bhalka Tirtha (Bhalka Pilgrimage) (Hindi: भालका तीर्थ) located in the Veraval in Saurashtra on the western coast of Gujarat, India, is the place where Krishna was hit by an arrow shot by a hunter named Jara, after which he is said to have left the earth for the heavenly abode, an act referred to in the Puranas as Shri Krishn Neejdham Prasthan Leela (Sanskrit: श्री कृष्ण नीजधाम प्रस्थान लीला). 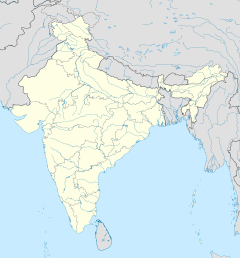 According to Mahabharata, the Kurukshetra war resulted in the death of all the hundred sons of Gandhari. On the night before Duryodhana's death, Krishna visited Gandhari to offer his condolences. Gandhari felt that Krishna knowingly did not put an end to the war, and in a fit of rage and sorrow, Gandhari cursed that Krishna, along with everyone else from the Yadu dynasty, would perish after 36 years. Krishna himself knew and wanted this to happen as he felt that the Yadavas had become very haughty and arrogant (adharmi), so he ended Gandhari's speech by saying "tathastu" (so be it). After 36 years passed, a fight broke out between the Yadavas, at a festival, who killed each other. His elder brother, Balarama, then gave up his body using Yoga. Krishna retired into the forest and started meditating under a tree. The Mahabharata also narrates the story of a hunter who becomes an instrument for Krishna's departure from the world. The hunter Jara, mistook Krishna's partly visible left foot for that of a deer, and shot an arrow, wounding him mortally. After he realised the mistake, While still bleeding, Krishna told Jara, "O Jara, you were Vali in your previous birth, killed by myself as Rama in Tretayuga. Here you had a chance to even it and since all acts in this world are done as desired by me, you need not worry for this". Then Krishna, with his physical body ascended back to his eternal abode, Goloka vrindavan and this event marks departure of Krishna from the earth. The news was conveyed to Hastinapur and Dwaraka by eyewitnesses to this event. The place of this incident is believed to be Bhalka, near Somnath temple. As per the writing in Ramayana, Rama, i.e. Krishna in his earlier Rama Avatar (Avatars) is supposed to have given a boon to a monkey king Vali (Hindu mythology) whom he killed indirectly in hiding and not directly fighting with him in front. The above action of the hunter in Krishna avatar (Avatars) is supposed to be in compliance to the boon of Rama i.e. Krishna in his earlier Avatar. It is believed that Krishna left his footprints. It is a common site of pilgrimage for people who visit Somnath. Bhalka Teerth is situated almost 4 kilometers away from the Somnath temple. Presently the government has planned to develop this temple also into a major tourist attraction. 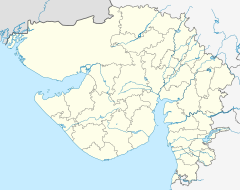 Somnath/Veraval/Bhalka is very well connected via road and rail network. Nearest railway station is Veraval and the nearest airports are Diu & Rajkot. Bus services are available from Ahmedabad, Vadodara, Rajkot, Dwarka etc. ^ a b c "Bhalka Tirth". Somnath Trust. Archived from the original on 29 July 2009. Retrieved 12 April 2015. ^ a b "Gujarat Tourism". Gujarat Tourism. Retrieved 12 April 2015. ^ "Lord Krishna's Disappearance, Disappearance of Lord Krishna, Life Span of Lord Krishn, Disappearance of Sri Krishna". Happywink.org. Retrieved 2011-10-23. ^ "MAHABHARATA -Krishna's Return to Heaven". Urday.in. Archived from the original on 2009-04-24. Retrieved 2011-10-23. ^ a b "Srimad Bhagavatam :: Conto 11 - The Ascension of Lord Krishna". Bhagavatam.in. Retrieved 2016-11-24. ^ Mani, Vettam (1975). Puranic Encyclopaedia: A Comprehensive Dictionary With Special Reference to the Epic and Puranic Literature. Delhi: Motilal Banarsidass. p. 429. ISBN 0-8426-0822-2. ^ "Addl trains chief demand at rly meet". Times of India. Jan 29, 2015. Retrieved 7 April 2015. This page was last edited on 13 January 2019, at 18:55 (UTC).